We can create customized silicone molds, food grade quality for pastry. an exclusive shape such as a logo or a typical object. 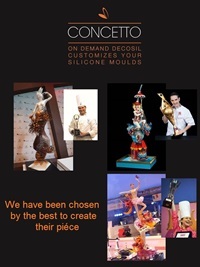 decosil® offers a unique and complete service starting from the creation of the model to the finished silicone mold. We manufacture any custom silicone mold, excluding those for baking in the oven, starting from a pattern, photo, design or idea you will send us. (e.g. : LENGTH 4 cm x WIDTH 3 cm x HEIGHT 1 cm embossed logo 0,2 cm). or the dimensions that the multiple mold must have and we will check how many cavities can be inserted. Step 4 Send the Request after completing the form. SILICONE MOLD whose cost depends on size, shape and how it is complex to make the object. Minimum order: 1 silicone mold. The first two elements are to be considered as one-off cost (cost of installation that will remain of your exclusive property), while the third element has a cost per piece. The production time to customize the molds is about 60/90 working days within payment date. Which is reduced if the model is provided directly by the customer.